It's Thursday right? Right? I am having trouble re-entering normal life. I know I have a ton of things to do, I just can't seem to focus on them. So yesterday I mostly lounged around. Later in the day I went through email and tried to get ready to hit the ground running today. Hahaha. Like I run. But I do have some fun things coming your way so I need to get ready. Is it getting chilly where you are? I still haven't turned on the heater, but today I'll head out and get a fresh clean filter for the heater so I have the option. And groceries. I need to get some of those as well. I'm sorry to say I don't have any good pictures of market. I did walk around one day before market, but the lights aren't all the way on and the handful of pictures I took are really blurry. I'm having trouble with the on-off button on my camera, I'm wondering if it's part of a bigger problem. I'm sad because that little camera has been my sidekick for a long time. Now to research and find a new camera. Yes, we're those people, the ones who read all the descriptions and then the reviews on the tech pages. Never fear though, the internet is full of quilt market photos. I did take some ridiculous 'selfies' with people for instagram and facebook, and you can find them here. One really fun thing about market this time was meeting some friends in real life. Like Robyn, who I've known for ages. 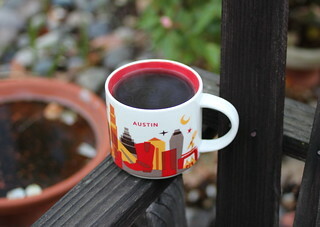 I'm having coffee with her in spirit this morning in the Austin mug she brought me. 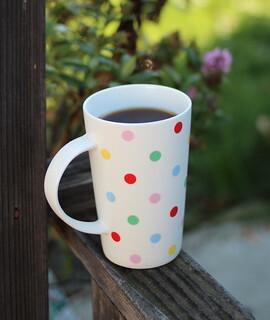 I'm on day two with this mug and it's perfect and holds a huge cup of coffee! I also saw some old friends and made some new friends and I had a great time. Of course market is about working, so I was at the LakeHouse booth taking orders and showing people Holly' s new collection Sausalito Cottage. This morning I am up and getting ready to head out to the airport. Its been a great few days seeing old friends and meeting new friends. It always seems extra exciting to meet people you 'know' online for the first time in real life. I saw lots of my favorite shop owners who are excited to be receiving their Pam Kitty Picnic soon and their enthusiasm and support means the world to me. Of course saw lots of my designer friends who were showing off their beautiful collections or their new books or projects. Its all very exciting. I will admit right now I took very few photos, and most of them you can find on Facebook or Instagram. Our booth was so busy I didn't get out much and when I did I just had a few minutes to connect with people. 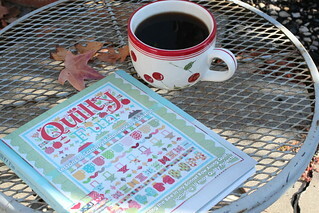 But don't worry, there are a gazillion quilt market photos online. P.s. my delicious coffee is courtesy of my friend Keiko who brought me 2 boxes of my favorite! She saved the day! Good morning! I am up early and excited to start the day! Ran into some fun people yesterday and hopefully will see more today. Of course its a busy work day with the remainder of set up and appointments. I will have a booth picture for you tomorrow morning. We're keeping it simple with the giant banner. 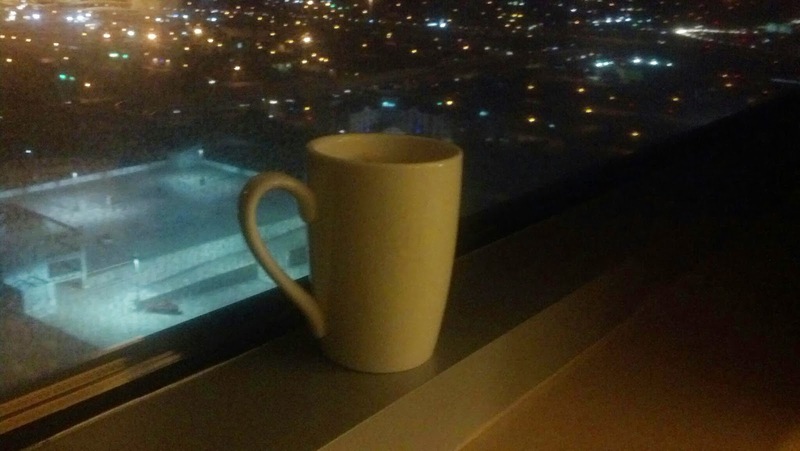 This morning's coffee is brought to you by yesterday's coffee, because this morning it's too dark outside for a coffee picture. I'm up at 2 and out the door at 3:30ish to get to SFO for this morning's flight to Quilt Market. I'll try and keep you guys updated on our trip! 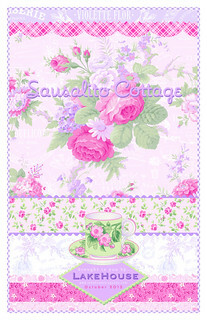 If you're headed to Quilt Market come by and say hi, we're in booth 2224 and we're showing Holly's collection Sausalito Cottage. It's a lovely collection commemorating her 10 year anniversary! Good morning! It's the calm before the storm around here! And that storm is QUILT MARKET! Time to think about clean clothes and the list of things I need to bring! But you know me, ProcrastiPam™, so I've been spending some time with coffee and this cute book out back! 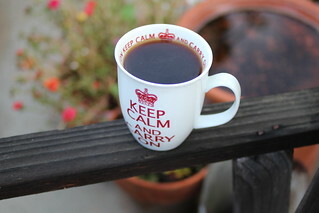 The weather is chilly early, but usually by my last cup of coffee the temps are perfect. 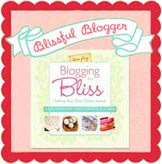 Lori's book is adorable and I've enjoyed all the projects and the peek into her cute little cottage! Howdy hi! How are you? Was the weekend good? We had a typical fall weekend in the mid '80s here in Northern California. The mornings and evenings are cool, but the days are warm. As long as it doesn't get hotter I guess I'm on board. I have seen people posting about snow already, so I guess I have zero room for complaint. Not that that's stopped me before.. The proof is in the pudding and here you go, the bag is done. It's very easy in spite of the complicated looks of it. Honestly you should give it a try, and not just because it's my pattern, which you can find here. I'd say the hardest part of it is deciding the fabric. I use buckram and fusible fleece on the outside of the bag, and interfacing on the lining to give it some body. It's big too. You can cram all kinds of stuff inside. You can make your own handles, but I like using those wonderful faux leather dot handles from Inazuma. And people, there isn't a day that goes by that I don't get asked about my purse. And not just by women. Ask Holly, I've been stopped by men at the La Boulange in Novato asking about it. Anyway, enough of me waxing poetic about my bag. I love it. Enough said about that. 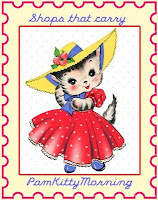 It's all Pam Kitty Picnic except the lining which is from Pam Kitty Love. My sweet little humming bird friends have been around a lot lately. I think it's the time of year, maybe a lot of food sources are gone in fall, fewer flowers? I see them buzz in and out to the feeder. The pair take turns, maybe one is on the look out. 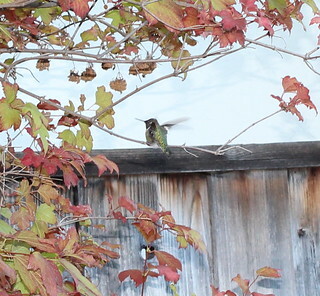 What I love about this pair of hummers is that they ignore me, or buzz around me and I can get quite close. It's the last day of the fall ClubHouse series today! I hope that you'll pop over and check it out. It's short and sweet and won't take much time. Thanks to everyone who watched the videos. When I get back from Quilt Market I'll be working on my Christmas ClubHouse. I can't wait to show you what I have planned! Hello! How are things your way? It's the usual around here, a little bit of this and a little bit of that. 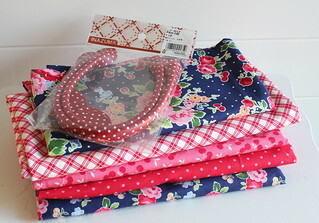 Yesterday I started on pulling out some fabrics for a new bag for market. I have a hard time deciding, especially with so many great choices. But I've been thinking about navy, I've had a red purse and a green purse, next up I think navy. I picked up a lot of handle options as well. I have some really nice navy handles, but I keep going back to red each time. I can't help it, I really love red. 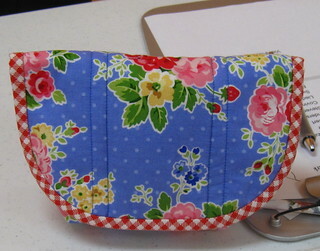 I think this purse will be navy red and pink. It's going to be fun. 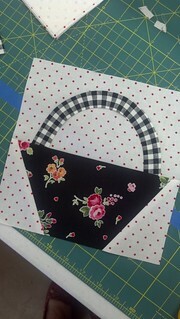 I'm making my Farmer's Market Bag, I love the pattern and it's a great purse to carry around. Today's Clubhouse video is about the tea towel. 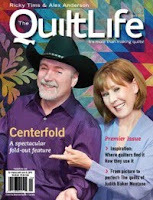 I hope you head over to The Quilt Show and check it out. Why yes it is the ClubHouse week! So it turns out I couldn't stop cutting those leaves, so I made a couple of other things that didn't end up in the ClubHouse ! I found these cool acorn bells early on in the season and hoarded them. Do you do that? I didn't know what I was going to use them for, but knew if I didn't get them they'd be gone. 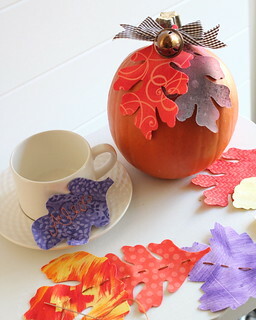 So I stitched a couple of leaves together with a ribbon and a bell and thought they'd look cool stuck on a pumpkin. Or at a place setting. 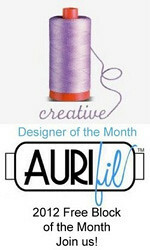 I also thought it would be fun to do some free motion name tags.. With the double layers and the fusible web it's nice and stable for stitching and it was quite easy. I used a larger leaf for easier handling. I also tried stitching the leaves together end to end with some perle cotton. You could stitch as many as you'd like and then tack ribbons on the end.. or maybe not even use ribbons, just tuck that garland in and around other decorations. Trust me, cutting those leaves is rather addictive. Today's ClubHouse video is about a Fall Banner. I think it turned out pretty and you could use this technique for anything. All you need to do is use your word processing program to print your letters out. 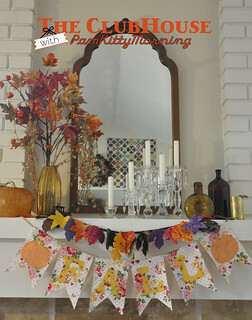 I've already got that taken care of for fall.. so I hope you'll head over and check it out! Sorry about yesterday's glitch about getting into see the videos, that should be taken care of today. See you in the ClubHouse! Happy Tuesday! How did Monday go for you? I had a pretty good day. I finished up my photoshopping (I think), finished sewing the tablecloth's for the booth and performed one of the most vile of household tasks, emptied the dishwasher. In my head I can hear Frankie saying "what? do you want a medal for that?" INDEED I DO. Just kidding, kind of. I don't know why that job bugs me, but it does. My snowball bush is positively radiant this time of year. 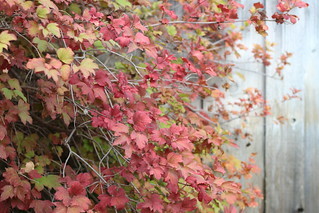 What a great plant, it rewards you twice a year, in the spring with beautiful green to white blossoms and in the fall, a show of color. And in between it's a haven for little birds who like to hide there. 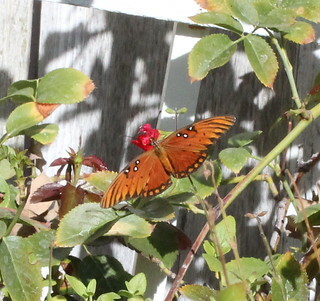 When I saw the bit of orange floating through the yard I thought perhaps I had a Monarch butterfly, on it's way to Mexico. Not this time. I don't get many and each one is a treat. This is a Gulf Frittillary. And today is the start day of my ClubHouse for Fall. 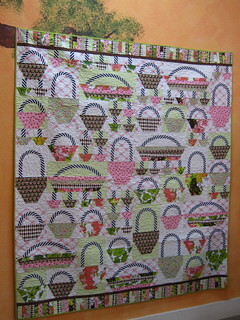 Hop over to The Quilt Show and check it out! There's going to be a test! How was the weekend? I spent most of mine in front of the computer photoshop sewing. Not nearly as fun as real sewing. 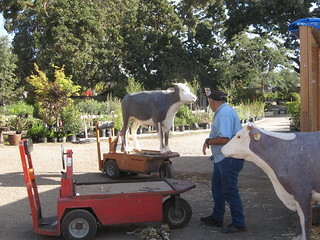 I'm getting excited about Fall Market and can't wait to see all the people I just get to see once a year. I'm excited to tell you starting tomorrow my ClubHouse over at The Quilt Show will be up, and it's a four part series this time, so click right HERE and go see what I'm up to!I have my own little commercial! I am warning you now, it was a long hard afternoon shooting this.. it seemed much harder than the first one! I hope you're all kind about my performance.. such as it is! Happy Friday! 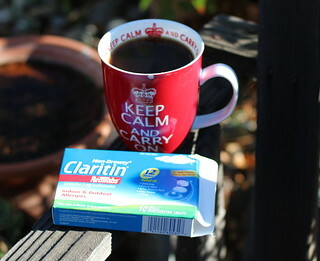 I think this week was brought to me by coffee and Claritin which works great for me, but does leave me a bit fuzzy. Still it was a great week. 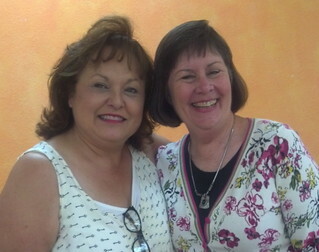 I had a good visit over to see Holly and Tracy at the Studio, and we had a nice calm dinner out, because you know the storm is coming, and that storm is QUILT MARKET. Wednesday I spend the afternoon with Alex and John taping my next session of my ClubHouse over at The Quilt Show. Fingers crossed we got it in like forty thousand takes, and it will be up next week. I really hope you'll take a look and check it out. 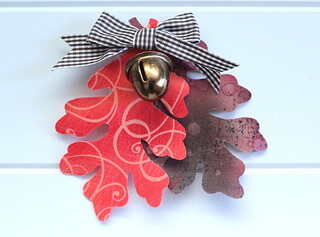 I have Four Fast Fun Fall Projects to show you, and I think they turned out ok! You know you don't have to be a paying member to check out my ClubHouse.. so go give it a try if only to satisfy your curiosity on just how ridiculous I can be. There's a lot of great content over at The Quilt Show website and you might fun just the thing you're looking for. Hi there sweet peoples... how are you? Been busy around here, as usual, but nothing seems all that exciting. I've been making the tablecloths for the booth, not hard by any stretch of the imagination. What is hard? Man handling (or is that Pam handling?) the fusible interfacing needed to make them nice and crisp. Today I plan on finishing those up. It won't be long. Monday I had some plans that fell through, so I confess to spending some time reading during the day. I've always felt like reading was one of the pleasures that you indulged in during your 'off time', like not during the day when you should be doing 'work'. Lamest thing ever right? But I'm old and set in my ways, and reading during the day seems like a forbidden pleasure. 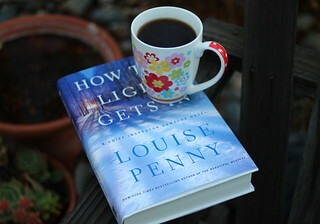 This series of books, The Inspector Gamache mysteries by Louise Penny, are probably the best books I've read in a long time. So if you like mysteries and involved stories with wonderful characters this might be the series for you. Ok back on track now. 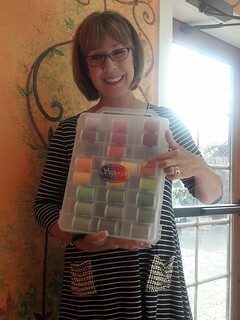 I picked up my last shipping samples from Holly yesterday. Yay.. now back on track today. What's on your agenda? Happy Monday! How was the weekend? I am already trying to remember just what I did, how sad is that? I know I worked on the tablecloths for the booth, and managed a bit of trimming on my basket blocks, but beyond that, blur. I guess I'm really going to need coffee today! Tell me what you've been up to! So class was super fun! 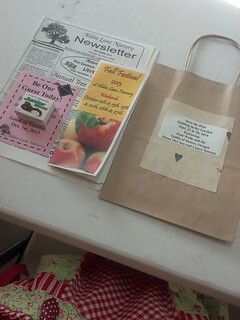 I got to Alden Lane early, like everyone else, to set up! Look at our cute place settings. Everyone had their own table, and it was set up so three tables were in a group, you still got to be close enough to talk to people and still had tons of space to work. I had all my cutting done in advance, so I was ready to go! Some of these photos are from my phone, I think I'm cool when I'm there, taking a lot of photos on my camera, then I download and it's a dismal handful. Laura Nownes is simply adorable. She's a great teacher as well and I really enjoyed her class. 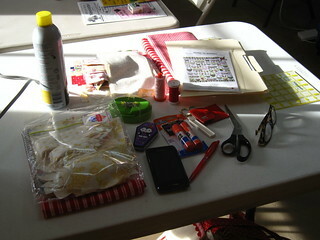 Super fun time sewing with friends in a great environment not to mention great instructions on applique, cutting and piecing. Alex came armed with lots of her own line of Superior Masterpiece Thread in case any of us were actually ready to applique our handles. Which, uh, turns out we were not. This is the quilt we were making. It's Laura's Going to Market pattern. 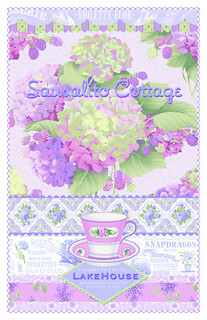 I love the colors, so cheerful. 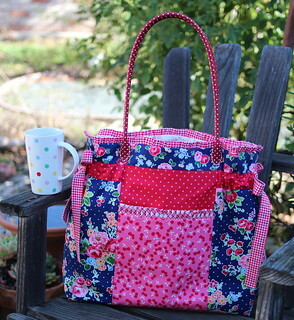 I've seen this quilt made up in a ton of different fabrics and they all look good. I really like the option of the mixed backgrounds.. well you already know that about me. 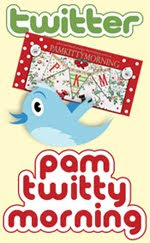 Totally a coincidence, Laura had a little bag full of sewing supplies made from Pam Kitty Love. Her friend makes them, and it's totally cute. Love the bias trim. I don't know that she even realized it was from my collection just a happy coincidence! I didn't steal it but I wanted to. Lucky me, I was totally spoiled at class, Alex prepped and glued down all my handles so I could do invisible machine applique later. And the handles she didn't prep, Laura prepped. I do have to do 2 handles at home because I miss cut 2 background pieces. And get a load of my lower block there, mixed up backgrounds. I thought I could leave it but I think I'll switch it out. 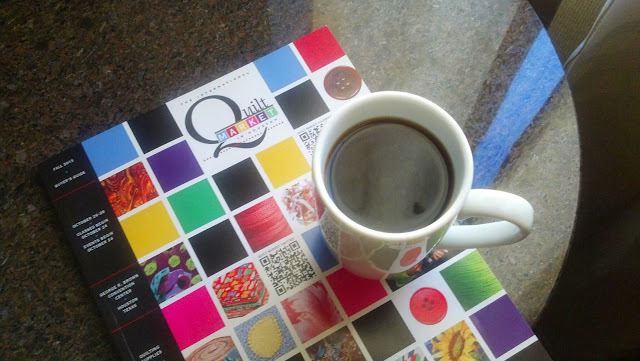 I really super love the larger yellow dot on white from Holly's Sweet Things collection, so I need to order another yard of that, I've used my supply up with this quilt. Here's my 3 friends (from the left) Deb, Deanna and Debbie. They, like several others in the class, were kicking off their retreat with Alex with this class. 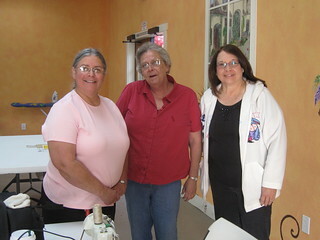 These girls are the super-friends I often sew with! 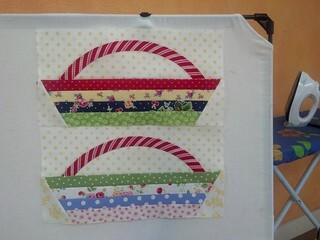 Debbie is making her quilt using Pam Kitty Love and this was her first completed block. I like how cute the gingham hand looks. 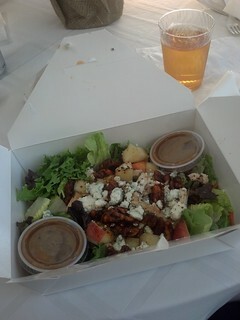 The weather was perfect, and we had a nice alfresco box lunch from Sweet and Savory Café and Bakery under the oaks. It was really a wonderful experience sitting outside and enjoying some fresh air, chatting with friends. Alden Lane couldn't be a nicer venue for this. The classroom is spacious and clean, lots of nice natural light plus good lighting inside. Drinks, petite scones, fresh fruit greeted us, and after lunch there was a candy selection and beverages plus fruit and midway through the afternoon there was a fancy popsicle break. Seriously, wouldn't even just a sew in be fun there? So how's this for totally crazy! 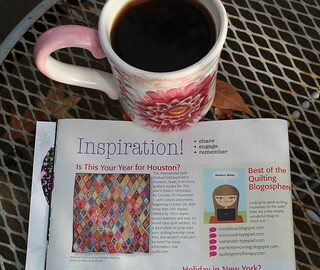 When I was at Quilting in the Garden my friend Nancy told me that my blog was on a list of quilting blogs in McCalls Quilting November/December issue! You know I had to race out and track down that magazine post haste! What list could I possibly be on? Holy cow people look at that list!!!! I can't even believe I'm on it. 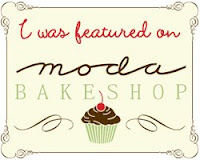 "Reliably Wonderful".. and look at who else is on the list!!!! YIKES, pretty impressive people. I'm so excited about it and of course now really have to step up my game a bit!! Thanks to the people at McCalls and thank you friends for coming here and having coffee with me. Just knowing I'm on YOUR list makes me happier than a clam.